We offer a comprehensive line of HANNA Instruments® meters for pH, conductivity, TDS, ion specific, dissolved oxygen, turbidity and other water quality parameters. This line of testing instruments is dedicated, but not limited to, water analysis in environmental and water treatment applications. Other industries such as Food and Dairy, Wine and Beer, Agriculture and Aquaculture, and of course Education and Chemistry Laboratories, commonly use the pH, conductivity, dissolved oxygen and ion meters. Portable Instruments: accurate, waterproof pH-meters, conductivity/TDS meters. 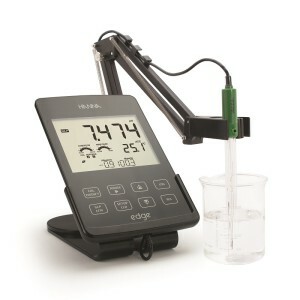 Smart Instruments: Edge™ for laboratory measurement of pH, Conductivity and Dissolved Oxygen; 3 instruments in one. Field Multiparameters Instruments: up to 15 water quality parameters, with GPS, ideal for field measurements of lakes, rivers and seas. Dissolved Oxygen (DO) Meter: portable instrument. If you do not find the instrument you are looking for, please do not hesitate to contact us. We will assist you in finding it from tens of other meters and probes. Complementary to this line of Analytical Instruments, we also offer a line of Digital Refractometers, as well as Automatic Titration Systems and Karl Fisher Titrators.